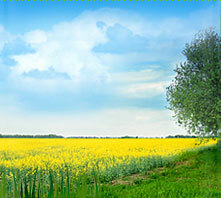 Biodiesel (fatty acid alkyl esters) is a cleaner-burning diesel replacement fuel made from natural, renewable, agricultural resources such as soybeans or rapeseed (canola) or recycled cooking oil from restaurants. Just like petroleum diesel, biodiesel operates in combustion-ignition engines, including cars, trucks, heavy equipment and boats. It can even be used in oil-based home heating systems. Blends of up to 20% biodiesel (mixed with petroleum diesel fuels) can be used in nearly all diesel engines, boilers and generators, and are compatible with most storage and distribution equipment. These low level blends (20% and less) don't require any engine modifications and can provide the same payload capacity and range as diesel. To summarize, biodiesel can be introduced into the existing fuel infrastructure and engine configurations. It is a biodegradable, renewable fuel that offers emissions benefits to improve air quality and control pollution. Biodiesel is the only alternative fuel to have passed the rigorous EPA Tier I and Tier II health effects testing. That study found that B20 (20% biodiesel blended with 80% conventional diesel fuel) reduced total hydrocarbons by up to 30%, carbon monoxide up to 20%, and total particulate matter up to 15%. It is domestically produced from renewable resources, thereby benefiting our nation's farmers. We reduce our dependence on foreign petroleum by 20% using B20 biodiesel, and use of as little as 2% biodiesel each year in the US would extend the fossil diesel supply almost fourfold for every gallon of diesel replaced by biodiesel. Superior lubricity is provided by biodiesel, even at very low-blend levels. This helps reduce equipment wear and premature breakdown. Additional economic impacts, such as increased employment, increased level of economic activity, and corresponding state and local tax revenue, will also occur. Pure biodiesel (B100) has a solvent effect, which may release deposits accumulated on tank walls and pipes from previous diesel fuel use. This release of deposits may clog filters initially and filters should be replaced after the first 24 hours of biodiesel use. There is no evidence that lower-blend levels such as B20 have caused filters to plug. Biodiesel has a higher cetane number than US diesel fuel. In more than 30 million miles of in-field demonstrations, B20 showed similar fuel consumption, horsepower, torque and haulage rates as conventional diesel fuel. Biodiesel also has superior lubricity and it has the highest BTU content of any alternative fuel. The information above has been provided from the Biodiesel board at www.biodiesel.org. Please see their great web site for much more detailed information concerning biodiesel.